Dr. Nondorf believes in lifelong learning. He attends multiple continuing education events and is a member of the Excellence in Orthodontics Study Club and president of the Dental Excellence in Northwest Indiana Study Club. These activities enable Dr. Nondorf to stay current on the latest techniques in orthodontics, including the use of Customized Insignia Braces, Invisalign®, and laser dentistry. By remaining current on developments in the field, he ensures his patients receive the best possible care. Dr. Nondorf was raised in Valpariso and attended Valparaiso High School where he met his wife, Jamie. They live in Valparaiso with their four children: Ella, Anna, William, and Jack. 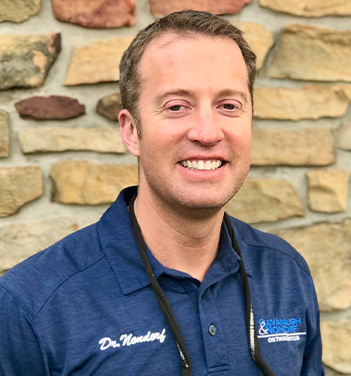 In his spare time, Dr. Nondorf enjoys working in his yard, spending time with his family, and reading/making up stories with his children.